It’s Yeezy Season 2, which can only really mean one thing – more body stockings, more ath-leisure wear and more Kardashians in one room than on Christmas day at the momager’s. Kanye West’s NYFW show was exactly what you were expecting – live-streamed to fans in cinemas around the US, it was held in a basement in Chelsea, where mortals entered through one door and celebrities (Hi Drake, Lorde and Courtney Love) through another. Both Kim and North were dressed in matching Yeezy camel ensembles, and this time, NW wasn’t crying about it. Clever Kimye had also given her a pre-show lollipop, which was an ideal distraction and made for some adorable family FROW moments. 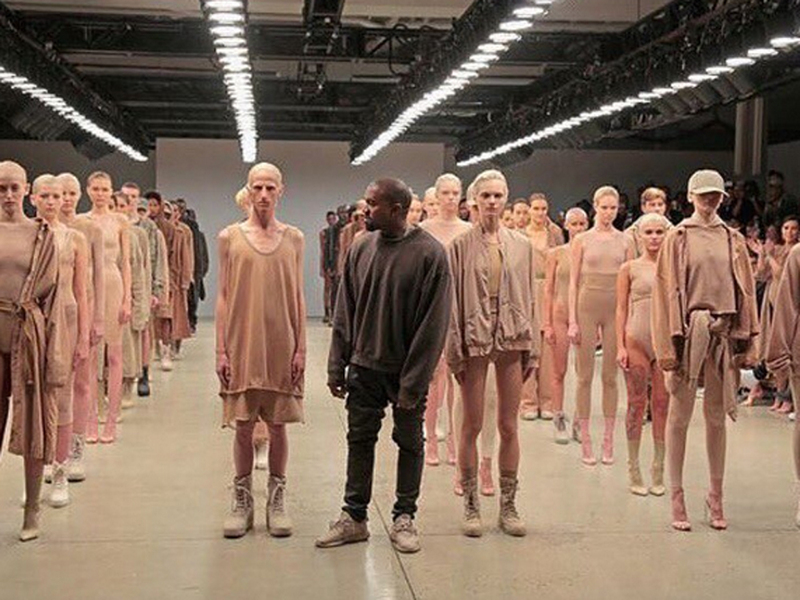 Kanye’s now-signature model army emerged in formation (their Kaiser was actually was heard shouting ‘forward, march!’ backstage) arranged in a tonal scale from lightest skin to darkest, front to back. The second round of Kanye’s collaboration with Adidas looks, well, kinda familiar, as flesh tones and mesh fabrics led the aesthetic for an effect very similar to last season’s range. Going more fashion forensic on the matter, we can see some new design developments from Yeezy (spray-on patent boots, the new mac silhouettes) but nothing that really stood out. But… but… Kanye couldn’t find room on his packed out front row for supermodel of the moment and actual sister-in-law Kendall? Madness. But how could anyone actually spot her? Undercover in Kanye camouflage, we had to actually do a double take on this one. ‘Congrats to my baby for a crazy sick show!!! !’ Kim K inevitably posted after the show. But the praise kept on coming from industry greats including Givenchy creative director Riccardo Tisci. ‘MAN I AM SO PROUD OF YOU, YOU MADE YOUR DREAM COME TRUE,’ he wrote on Insta, caps lock ON. ‘THE COLOR PALETTE WAS HEAVEN. THE SHAPES AND MATERIALS REPRESENT TODAY’S AMERICA. LOVE #kanyewest #yeezy #bravo’. That’s us told then.